Condition is Used. It does not leak. I can send extra pics. Includes two carbon fiber poles to use in lieu of trekking poles or to extend sides. I value my life. 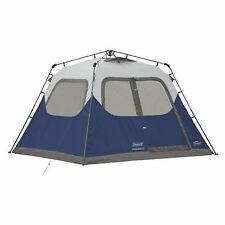 Big Agnes Tiger Wall UL 2-Person Ultralight Camping Tent NEW/FREE SHIPPING . Condition is New. Shipped with USPS Priority Mail. EASY TO SET UP AND CARRY - The tent can be installed by 1 person easily and quickly for its professional design. - Tent structure: dual doors and dual layers. Inner Tent x 1. Tent Stakes x 12. - Body poles: 7001 Aerospace Aluminum Alloy. This is possibly one of the most versital shelters we've ever built, this one has no seam to seal one big tarp! This1.1 Silpoly in Olive Drab color can also be set up as a tarp in an unlimited number of ways with 8 guyouts total. Not sure if this is an Outfitter or Timberline version of Eureka. Tent side white area has a pin hole. This is an excellent tent very comfortable and cool. 8'6"x6'10"x4'10"tall. This has been a nonsmoking tent. Tent Floor waterproof index: 3000mm. -Inner Tent x 1. -Tent Stakes x 8. -Tent Pole x 3. -Rain fly: 190T polyester cloth PU2500 Coating. Set up quickly with easy-to-follow instructions. -Flysheet waterproof index: 2000mm. Detachable Rain Fly. Polyurethane Coating. Classic Pup tent, dependable fast and easy setup! 2 Person Trail Tent. Woodland Camouflage Pattern. Polyurethane Coated Lightweight Taffeta. Reinforced Polyethylene Floor. Never sleep on the ground again with this uniquely designed ThisAir Mattress Sleeping Bag Combo Pop Up Tent Cot. Featuring a detachable one person tent, air mattress with foot pump, and pillow, this cot is perfect for the individual camper. Tent Material Tent Floor Material 1 x Camping Tent with Rain fly. 1 x Tent Carry Bag. Camping Tents. Folded Size In Carry Bag We will try our best to solve any issue. 210D PU3000 Oxford. This free-standing, four-person tent requires no assembly — the poles are pre-attached to the tent. Just unfold, extend, and you're ready to camp! It comfortably fits one queen air bed or up to four campers in sleeping bags on the floor. This free-standing, four-person tent requires no assembly — the poles are pre-attached to the tent. Carry bag included / Tent stakes included. Just unfold, extend, and you're ready to camp! It comfortably fits one queen air bed or up to four campers in sleeping bags on the floor. KHAKI color can also be set up as a tarp in an unlimited number of ways with 8 guyouts total. This tarp weighs only 7.8 ounces with stuff sack. The C Bar 2 and 3 person tents are a lightweight shelter option designed to be roomy with DAC Angle hubs and a cross pole on the top. Vestibule Area 11 sq ft / 1.0 m². Reflective guy lines and webbing on tent corners. Used a stock photo because it is currently put up. 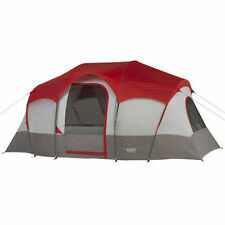 But the tent and all its components have zero wear or tear. It has been used on one overnight and kept in storage otherwise. Great tent. This1.1 Silpoly in Olive Drab color can also be set up as a tarp in an unlimited number of ways with 8 guyouts total. This tarp weighs only 8.4 ounces with stuff sack. This free-standing four-person tent requires no assembly because the poles are pre-attached to the tent, just unfold and extend. It comfortably fits one queen air bed or up to four campers in sleeping bags on the floor. 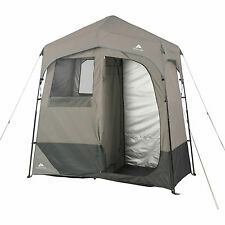 Woodland Camouflage Trail Tent Camping Waterproof Fits 3 People (3808). Fire Retardant Tent. Made from 100% Polyurethane Coated Lightweight Taffeta Material. Great for Camping, Campers, Hikers, Fishing & more! 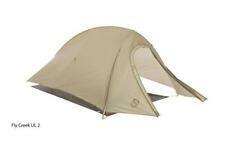 This1.1 Silpoly in KHAKI color can also be set up as a tarp in an unlimited number of ways with 8 guyouts total. This tarp weighs only 9 ounces with stuff sack. This1.1 Silpoly in COYOTE BROWN color can also be set up as a tarp in an unlimited number of ways with 8 guyouts total. This tarp weighs only 8.3 ounces with stuff sack. This tarp is in WOODLAND CAMO color can also be set up as a tarp in an unlimited number of ways with 8 guyouts total. This tarp weighs 14 ounces with stuff sack. This1.1 Silnylon in BLAZE ORANGE color can also be set up as a tarp in an unlimited number of ways with 8 guyouts total. This tarp weighs only 8.9 ounces with stuff sack. Internal Peak Height (Tarp), in 48". Internal Peak Height (Tarp), in 43". Both side doors can be guyed out in calm conditions to improve ventilation and increase usable space. 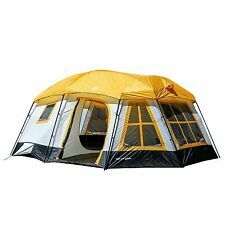 Doors can be opened from the top using two-way zippers, while remaining protected by the awning. 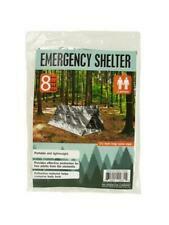 UL HIKER - Ultra Light 6 X 9 Shelter WHITE Limited Edition "Snow Hunters"
Just out the 6 x 9 Shelter. This tarp weighs only 8.6 ounces with stuff sack. The Big Agnes Fly Creek HV UL 2-Person Camping Tent, redesigned with steep wall architectural and a vertical door to maximize floor and head space. These features create more livable space for more comfort in the backcountry. Our award winning Fly Creek tents have been redesigned with steep wall architecture and a vertical door to maximize floor and head space. These features create more livable space so you can be more comfortable in the backcountry. Big Agnes redesigned the award winning Fly Creek UL2 tent with steep wall architecture and a vertical door to maximize floor and head space, resulting in more comfort, living space, and room to move around in your tent. Two Man Mountain Trail Tent Woodland Camo. MSR ACCESS 3 TENT: 3-PERSON 4- SEASON ORANGE, ONE SIZE. Rothco Camo Two Man Trail Tent. Two Man Trail Tent is made of durable waterproof (pressure 650mm)/ fire. will comfortably fit two people. The tent also. retardant polyurethane coated lightweight taffeta. Reflective guylines and webbing on tent corners. simple, efficient and classic. If it's your cross-country bike tour or. We are adventurists sharing the outdoors with everyone. We pride ourselves on honesty and work hard to get what you need at the best price possible. Trail Weight 2lb 11oz / 1.19kg. The Tiger Wall UL tents are our lightest two door/two vestibule, technical backcountry shelters yet. Combining simple, yet strong single pole architecture with DAC Featherlite materials, interior storage pockets, and comforts around every corner, these tents are poised to be a backcountry favorite. Like a gin martini or a peanut butter and jelly sandwich, Seedhouse SL tents are simple, efficient and classic. If it's your cross-country bike tour or the weekend peak you've been looking to bag, the Seedhouse will forever be faithful. The Tiger Wall UL tents are our lightest two door/two vestibule, technical backcountry shelters yet. Combining simple, yet strong single pole architecture with DAC Featherlite materials, interior storage pockets, and comforts around every corner, these tents are poised to be a backcountry favorite. BIG AGNES 2 TSHSL216 BIG AGNES 2 TSHSL216 Seedhouse SL 2 Person Tent. Model Number: TSHSL216. Manufacturer Part Number TSHSL216. Product Model TSHSL216. Like a gin martini or a peanut butter and jelly sandwich, Seedhouse SL tents are simple, efficient and classic.